To recap, we have been working on adding ALL of the Sherwin-Williams paint colors to the Rugh Design Color Wheel. Our plan to have all 1700 colors up by the end of 2018 is on track and with this post we are about at the half way point. Which means that we “only” have about 400 more colors to go! We will continue to release 25 new colors with my hand picked color schemes each week. In addition to the new 25 colors a week I will highlight 1 color from Sherwin-Williams that I personally love or stands out. Recently, we have highlighted Wool Skein (beige with slight green undertone), Alpaca (warm greige with slight violet undertone), Dover White (warm white), Colonnade Gray (warm gray) and Oyster Bay (green/blue-gray). This week I wanted to focus on a color that I can’t believe I haven’t written about yet for a Color Wheel post: Anew Gray. I have written about Agreeable Gray, so maybe that is why I didn’t realize it sooner. Anew Gray is one shade darker than Agreeable Gray and is considered a warm greige in my book. Meaning it is not a true gray, but not a true beige either, a little mix of both: greige. Anew Gray has a warm feel to it and goes well in schemes with warm gray/greige/taupe selections (tile, backsplash, countertops, etc.). I tend to specify Anew Gray in homes that have higher ceilings and/or more natural light since it is a step up from the lightest shade on the paint swatch (like I just mentioned: Agreeable Gray). Anew Gray is one of my top neutral paint colors used in my Color Consultations because it really is a perfect transition color. If you are going away from the golden beige colors, but don’t want to go full gray either, Anew Gray is an ideal choice! Okay, now that you have a basis for Anew Gray, check out my Pinterest gallery for some inspiration. See below and let me know which one you like the most. If you have your own pictures, send them to me and I will post them! Also, check the Anew Gray color scheme page for my hand pick color schemes! Anew Gray is a great overall neutral paint color for a home, especially interiors. Like I mentioned previously, it works well in spaces that have high ceilings and a bit more natural light. 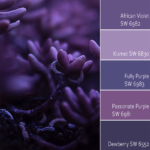 I prefer to keep my main paint colors softer, but even if you have lower ceilings and less natural light and just like a more saturated wall color, then by all means go for it and use Anew Gray! I love the inspiration picture below that has super high ceilings with Anew Gray for the main overall paint color. The palette is neutral and monochromatic which lends itself to an elegant feel in this living room. 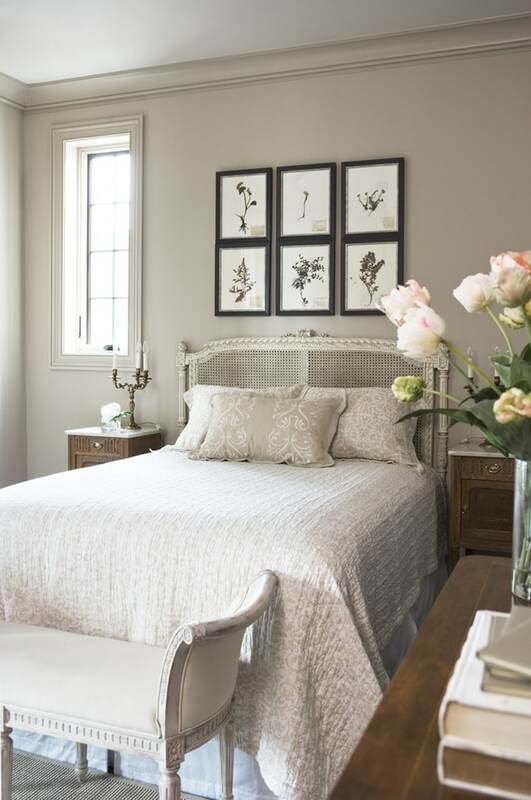 Not only does Anew Gray look spectacular for an overall neutral paint color, I also specify it often as the wall color for a bedroom, master or otherwise! Typically, I like a bit of a contrast with the crown molding and trim in a classic white or cream, but in this bedroom pictured, the trim and wall color are both in Anew Gray for a seamless look. Anew Gray on walls and trim in a bedroom by Lisa McDougald Design. 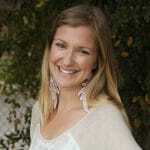 Rachael Boling Photography. One more place to use Anew Gray as a wall color is in none other than the bathroom. I love this master bathroom with Anew Gray as the wall color. The tile floor actually has a lot of warmer beige tones to it, mixed with some taupe and gray. Anew Gray is a perfect wall color to tie it all together along with the white cabinets as a perfect contrast against this gorgeous greige. I’m already pretty crazy about Anew Gray, but I am even more crazy about Anew Gray as a kitchen cabinet color. Greige on cabinets creates a warm feel and gives the cabinets some character. 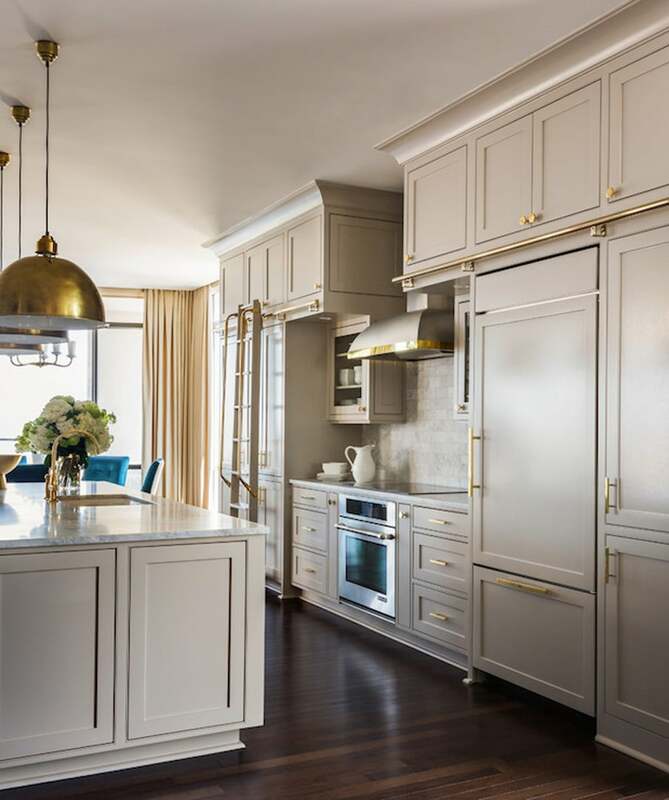 Speaking of character, check out the brass fixtures and custom sliding ladder in this kitchen pictured here! Anew Gray may be my one of my top go-tos for interiors, but it is also a premium choice for exteriors. You know me, I love white trim and Anew Gray as the main body color with a bright white trim for an exterior, is a perfect combo. Quick note here: it’s important to consider your exterior and interior colors and make an effort to coordinate them. 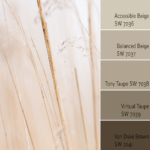 They don’t have to be matchy-matchy, but it is vital to a cohesive design to think through the color schemes you choose for exterior to translate over to the interior. For instance, if you have greige colors in your interior, then using a few greige tones on the exterior is a great way to tie everything in. If you are considering Anew Gray, the best way to find out if it is right for your space, is to grab a sample and test it out. I like to paint a large white cardboard so that you can walk around with it and see how it looks in different areas at different times of the day. If you are still having trouble deciding, contact me for a Color Consult to nail down the best color for your interior or exterior. I have a passion for color and love being able to help clients find the right color to make their home beautiful! Anew Gray had the spotlight, but I also wanted to highlight a color from the Color Wheel update, Wallflower. 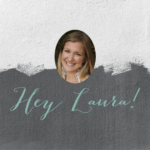 My room growing up was a soft lavender color, so naturally I love Wallflower for that reason! I found a super cute little girls room with Wallflower as the wall color. This is a perfect color for a fun and sweet girls room with accents in coral, yellow and pink! I am looking at the color Zicron 7667 by Sherwin Williams. I have anew gray in the kitchen currently. We put up a marble backsplash and it is looking brown now. I saw this color in a model home and it looks blue gray in that home. Though it might look good in my house but all the rooms connect and there would be no cut off. Im not sure what to do. Are you thinking of repainting the kitchen in Zircon or another space? I agree that making sure that the colors is cohesive in all areas of the home is the right move. 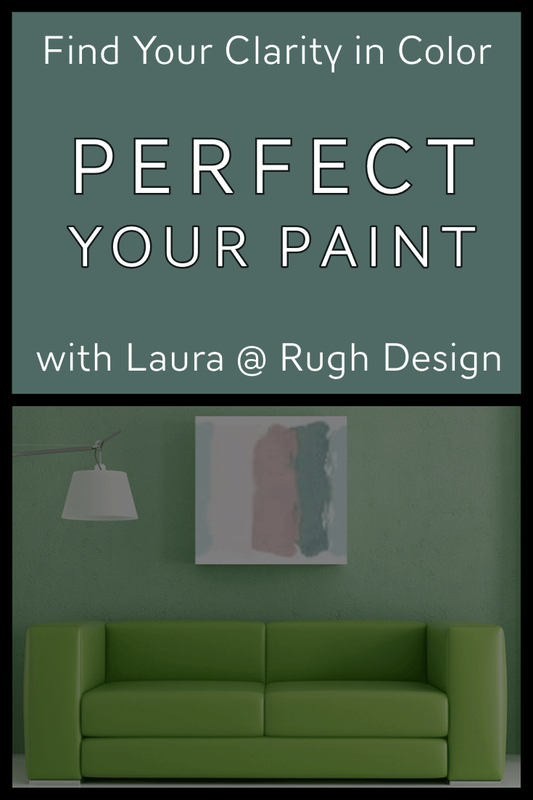 I would love to help you find the right color for your home by viewing pictures of your space via an Interior Color Consultation. Let me know if you are interested! I used Koi Pond in a small bathroom. What color or colors for rug, towels, etc…would you use? I am trying to pick paint colors for the exterior of our new home. 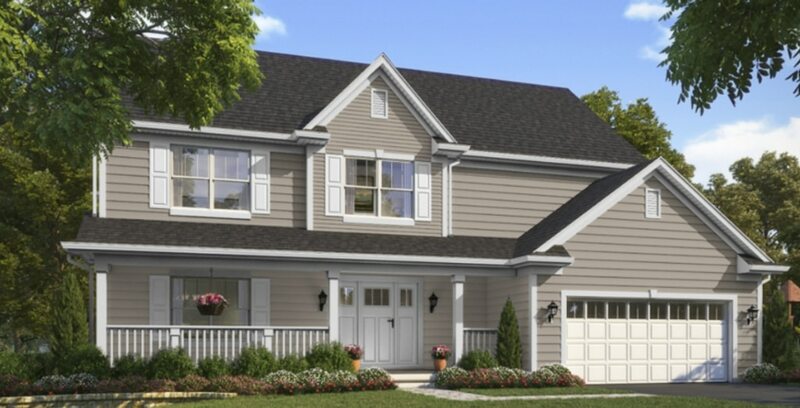 I’m considering possibly agreeable gray with white trim and a nice deep blue color for shutters and door. There was a photo you posted with agreeable gray on walls and a counter island that was an awesome blue color. You mentioned that blue color was cityscape but when I looked cityscape up, it was a dark gray color. What nice blue color would you recommend to go with to make the shutters and door have a nice contrast with the agreeable gray. My house is surrounded by a lot of big trees and the front of the house is shaded a lot. Do you think the agreeable gray will look pink? I have heard it may look pink or the exterior. I was also considering using worldly gray on the exterior but they say that may look green and with the trees around, I feel cautious about that. What do you think? Also, what color white trim would pair nice with agreeable gray (or worldly gray if you think that one is better on exteriors). The house is a colonial with columns and a front facing garage. I was also considering painting the exterior and trim alabaster because that’s a great color, but I was worried maybe it would be too white? Currently the house is half brick half siding and we want to paint the brick and siding to match. The roof is a brown color and that won’t change since it’s brand new and we just bought the house with it. If I did alabaster, would you recommend painting the garage the same color as the shutters so the garage area isn’t just a blob of white lol (it is forward facing and there is no window above it). What color shutters and front door would look nice with alabaster? I’m sorry I’m all over the place but having a very hard time deciding. Any and all suggestions are so appreciated! Thinking about Anew gray in my living area. I have a tall ceilings. The room faces south gets a fair amount of natural light. I like earthy warm colors. This is color is going a little to gray. Any suggestions another color to try to keep it warm? We have yellowish oak floors and white trim. A white vaulted ceiling. I bought a sample of new gray and painted to coats on part of my wall, which is currently Navajo White. The color on that wall looks totally different from the sample I painted on a white background. Could the Navajo White affect the color? Hi there! I am currently having the entire interior of my house painted anew gray. I’m looking for a darker greige that would be nice to use on the interior of my front door. Everything I find is too grey and doesn’t have the beige tone…any recommendations? My rule of thumb when coordinating lighter and dark accents is to go several shades darker on the same paint swatch. Try several shades darker than Anew Gray and test out how it looks. If you are still having trouble, please feel free to reach out for a Color Consultation! I am updating my home, and will be painting the walls SW Anew Gray in main living area, and Agreeable Gray in the bathroom and laundry room. All of the trim and doors are being replaced, and I am trying to figure out what color of white to use for them. I love the look of SW Snowbound (I have seen it on cabinets), but was wondering if it is too cool of a white to coordinate with Anew Gray. I am also considering SW Pure White. Your help would be appreciated….whites are so confusing! Thanks so much! I’m not sure which comments you were looking at exactly, but to answer your question: yes, Sea Salt and Silver Strand can both work with Anew Gary. I do think it depends on the space you are using it in, however. 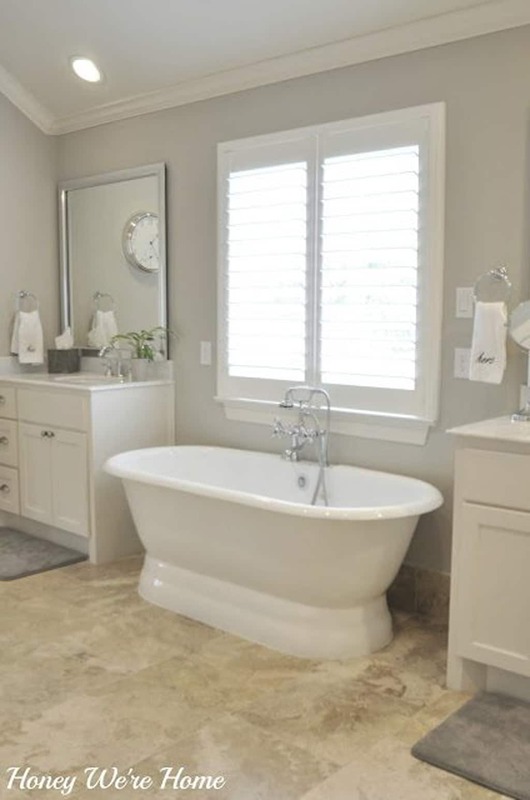 Sea Salt has less gray in it and some clients prefer it in spaces like bathrooms, laundry rooms or bedrooms. Silver Strand has a bit more gray in it and can be a bit more versatile. I hope this helps to clear up any confusion! I will be painting living room Anew Grey. Will Raspberry accents work? Thanks for reaching out! Yes, I think raspberry accents would work well. 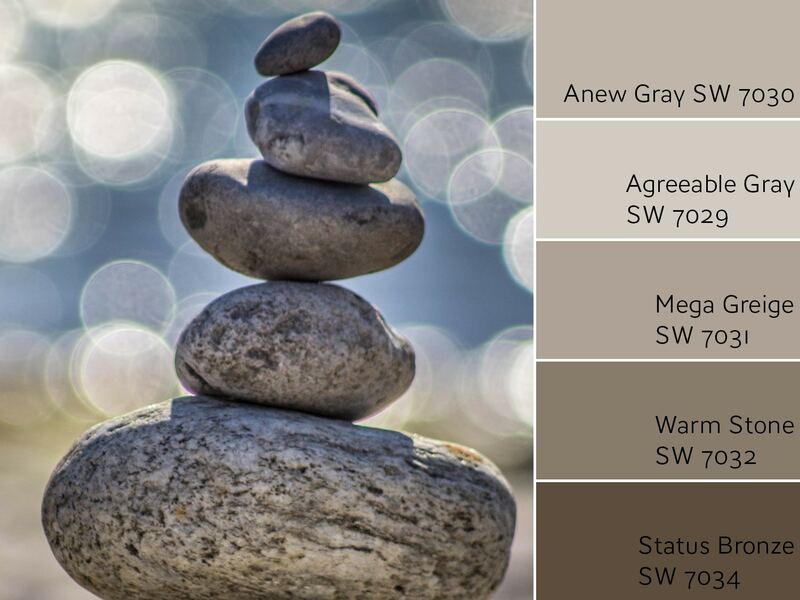 Anew Gray is neutral, but has a warm greige undertone that will work with reds. I also like to use some contrasting colors like blues and greens to create an interesting color scheme. If you get a chance, send me some pictures of your finished living room! What color faux wood or wood blinds go well with anew gray color walls in the whole house? Check out my Anew Gray color scheme page to see my selections. There are 4 schemes to choose from that should help get you started in the right direction. If you need more help check out my Interior Color Consultation packages.